I love love love good hummus. My previous BF’s family was Armenian and spoiled me with some unbelievable meals, most being served with hummus and baba ganoush. I put it on everything. Although hummus is packed full of fiber it is still quite high in fat. Moderation is key but if you’re like me and can’t get enough, try this healthy alternative. I must admit, not quite as good but still tasty none the less. Combine all of the ingredients in a food processor. Set to puree and scrape the bowl frequently. If the mixture is too thick add a small amount of water at a time until it reaches your desired consistency. Test taste and add more lemon, salt or pepper as needed. Spoon into a shallow bowl and top with a drizzle of olive oil and sprinkle of cumin. 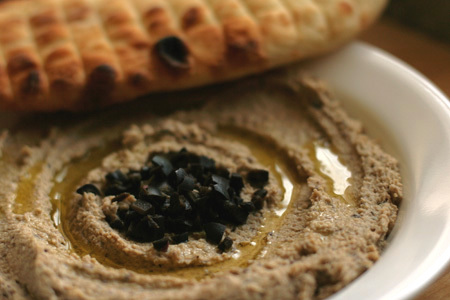 Hummus can be stored in your fridge covered for up to 4 days. This entry was posted in Spreads & Condiments and tagged black olives, chick peas, healthy, hummus, yogurt. Bookmark the permalink. Oh my gosh this sounds delicious! It’s on my list of recipes to try ASAP! I love the idea of adding olives to humus. Sounds so so so yummy. Ahh, thanks Tania! You can add many flavors to hummus; sun-dried tomato, roasted pepper, herbs… It’s a versatile little treat. Btw, love love love your site. I’ve heard of many treats being added to hummus, but since I’m a dud in the kitchen, I rely on recipes to make dishes like this 🙂 I may have to experiment with the sun-dried tomato too… uh oh, now I’m hungry.